A rough afternoon in Kansas City might have taken a disastrous turn. 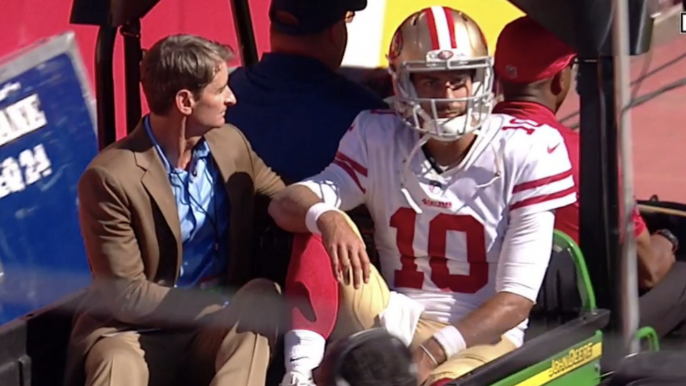 Garoppolo was reportedly visibly upset on his way to the 49ers locker room, and was seen hopping on one leg down the hallway after being evaluated. Jimmy Garoppolo sustained knee injury. He just passed me in a cart on way to #49ers locker room. He was visibly upset. Jimmy Garoppolo got evaluated and just hopped on one leg down hallway into locker room. Head coach Kyle Shanahan fears the injury could be serious. C.J. Beathard took over for Garoppolo after he exited. The 49ers lost 38-27 to fall to 1-2 on the season.